Travel can be an enriching way of understanding different cultures and developing an appreciation for nature’s beauty. Yet, the negative effect that travel can have on the planet is undeniable. Huge carbon emissions, vast energy consumption, and excessive water usage are all unfortunate side products of many forms of travel. But a growing number of travelers are becoming far more conscious about how their actions and choices can impact the environment. It's been suggested that the only way to truly travel greener is to not travel at all, but that seems extreme? There are plenty of ways to reduce your carbon footprint, both large and small, that can have a positive impact on the environment. Even better, many of these strategies can actually save you money in the process. By packing light, you'll be carrying less weight, which means that if you're traveling in a vehicle, you'll use less fuel, releasing fewer emissions. The less gas you have to buy for your trip, the more money you’ll save. Our incredible overconsumption of plastic has been deemed an environmental crisis. That certainly makes sense since a million plastic bottles are purchased every minute, and 91 percent of plastic produced is not recycled. A 2015 study found that by midcentury, we'll have more plastic in our ocean than fish, ton for ton. Help solve the problem by carrying a reusable water bottle with you when you travel so you can avoid buying bottled water. You can also get filtered water bottles, which will allow you to drink water from virtually any source by filtering out up to 99.9 percent of harmful contaminants. As a bonus, you'll also save a small fortune on the pricey bottled water by carrying your own bottle. Particularly in countries where gas guzzling transport is cheap, it's easy to fall into the trap of getting taxis everywhere, or hiring a vehicle. However, by far the two greenest ways to get around are to ride a bike or walk. This is a vital step to take when you're heading away on vacation, and can have a significant impact on both the environment and your wallet. The most important move is to ensure your heating or cooling systems are completely off (unless the temperature is going to drop below freezing, which could lead to frozen pipes). Carrying your own tote bag with you when you're on vacation will mean you're further reducing your plastic consumption. Whether you're picking up some groceries or doing a bit of souvenir shopping, not using plastic bags will lead to both carbon savings and less pollution. You may be able to save money, too. In many countries and some U.S. cities and states, there is a charge for plastic bags. Though it's usually quite a small charge, over time, the price of using plastic bags can add up. A large chunk of the earth's energy comes from the sun, so why not harness some of it to make your travels greener? Electrical gadgets like tablets, phones, and e-readers have become a regular part of most people's vacation packing list. But that doesn't necessarily mean you have to plug them in each night. This may sound like madness to AC lovers, but people have survived with minimal misery in hot weather conditions for thousands of years without using one. There are plenty of other ways to keep yourself cool when the temperatures rise that don't drain as much electricity. A fan is an effective way to keep you cool in your hotel room at night. If presented with the choice, go for a fan room over an air-conditioned one, which will ordinarily cost less as well. If you feel it's an absolute necessity to use the air conditioner in your room, then at the very least, be sure to turn it off every time you leave the room. Air travel is bad for the environment, there are no two ways about it. 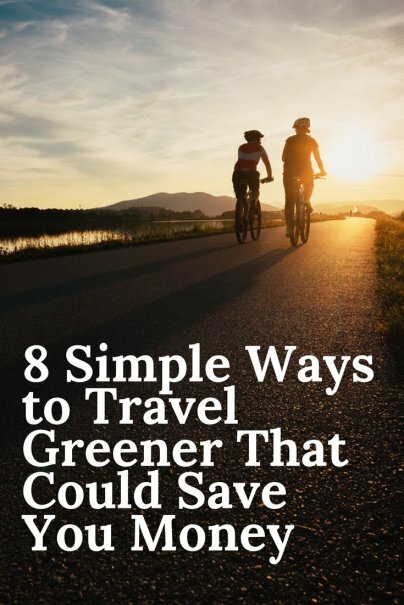 But there are a number of ways to reduce your personal impact and make your flight a little greener. Choosing the shortest route with the fewest connections will cut down on your time in the air, ultimately using less fuel. Many airlines now allow you to use digital boarding passes instead of printing them, so opt for it if you can to use less paper. Finally, some airlines have carbon offset programs that allow you to reduce your carbon footprint by donating to carbon reduction projects.